Our highly skilled team of dentists, hygienists, and support staff strive to improve the overall health of our patients by focusing on preventing, diagnosing, and treating conditions associated with teeth and gums. Please use our dental library to learn more about dental conditions and available treatments. Please note that not every treatment described in this library is available at our office; should one of these treatments be required we will direct you to a qualified, trusted specialist. Even if you brush and floss your teeth faithfully, it is important that you have your teeth professionally cleaned on a regular basis. (Of course, if you aren't quite so meticulous about your oral hygiene, it's even more important!) After a thorough cleaning, your teeth will feel smooth and squeaky-clean, and they will probably look a lot brighter too. But professional teeth cleanings aren't done for looks alone. Why do your teeth need this kind of attention? Essentially, it's because over time they tend to build up a layer of plaque (a sticky, bacteria-rich film) and hard deposits (called tartar, or calculus) that are very difficult to remove without special tools. When these deposits are allowed to remain on the tooth surfaces or below the gum line, they provide ideal conditions for bacteria to grow and multiply. The acids produced by some bacteria cause tooth decay and gum disease; if left uncontrolled, this can lead to inflammation and infection of the gums, and possibly influence systemic (whole body) diseases. Dentists have a special term for preventive procedures like tooth cleaning: prophylaxis, from the Greek word meaning to protect or guard against. In this case, the focus is on preventing tooth decay and gum disease. Performed in conjunction with a routine dental examination, a professional cleaning can go a long way toward controlling these two common maladies. While your teeth are being cleaned, it's also a good opportunity to take a close look at your oral health in general and check for a few specific problems. Teeth cleaning is often performed by a dental hygienist — a highly trained technician who uses a special set of tools designed just for this purpose. Because everyone's teeth are a little different, your cleaning will be tailored to your particular needs. However, many cleanings follow a similar pattern. 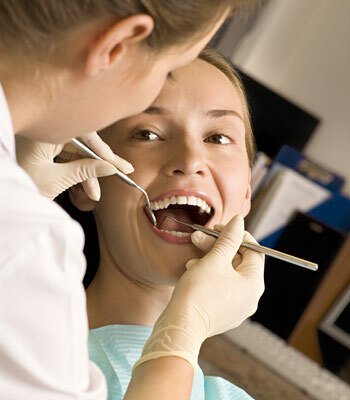 First, the dental hygienist will do an oral examination to evaluate the health of your oral tissues. Then the cleaning will take place using either an ultrasonic scaler or metal instruments referred to as curettes to remove the plaque and calculus from the tooth surfaces. The ultrasonic scaler is a hand-held tool with a tiny tip that vibrates at a very high frequency. Hardened deposits are broken up by the rapid movement of the tip, which does not damage the tooth. A constant stream of liquid (called lavage) serves to cool the tip and aid in plaque removal; at the same time, it also washes away the debris. Some hygienists prefer curettes, which are hand-held instruments that are curved and tapered to fit around and in between the teeth. If your teeth are sensitive, using hand-held instruments may be more comfortable for a professional cleaning. In the capable hands of a hygienist or dentist, it takes only moderate pressure to remove any stubborn buildup and scrub the teeth clean, regardless of which instruments are used. Finally, your teeth are polished with a low-speed rotary brush fitted with a soft rubber tip. A slightly gritty, toothpaste-like gel is applied, and the tip spins around and polishes the teeth, making them smooth and shiny. Most people don't feel any noticeable discomfort during dental cleanings; some even report they enjoy the experience — especially the dramatic results when it's done! If you haven't had a cleaning in a while, however, it may take you a few moments to get used to getting your teeth cleaned. If you experience any discomfort, however, it may be possible to apply a topical numbing gel or another type of anesthetic. If your gums are irritated due to bacterial buildup, they may become sore or bleed slightly during the cleaning. It may be possible to prevent this from occuring in the future with oral hygiene measures you can perform at home (such as improved flossing techniques or special mouthrinses); it might also indicate that you need more frequent in-office cleanings. This type of regular maintenance will help you avoid more involved dental procedures down the road — and it will give you the best chance of keeping your teeth for life!